If you have not gotten your PDF copy of Christi Friesen’s “Birds of a Feather” book, please order the book here. By this time, we are 7 months and approximately 24 projects into the total 40 projects in the 2013 Friesen Project. I hope that by this time you are working toward distinguishing yourself from Christi. If we can not do our own versions of Christi’s art, then we can never learn how we work with clay or how we can achieve our own unique style. Therefore, as my projects are starting to differentiate from Christi’s tutorial and what is presented in the book, I hope that your projects can be based in Christi’s style while allowing your own voice to shine through. Finding your “voice” is about finding what defines you as an artist. BEFORE YOU BEGIN: A note before you begin. You always need to start a project with the END in mind. What are you going to do with your project, how will you display or wear it, what will you do with it? These are some basic questions that will help you in your process. Condition and blend your clay. 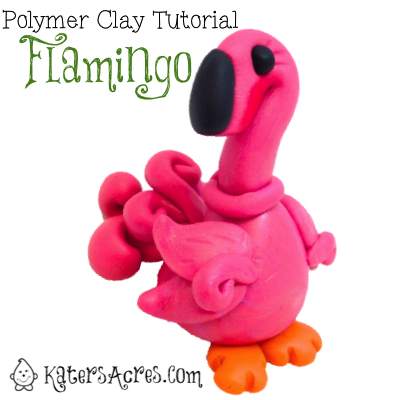 NOTE: If you don’t want your polymer clay flamingo to be solid pink, blend multiple colors to create a new blend. Allow the colors to marble tightly so when you look at the clay it looks special, unique, and interesting. Make a ball out of all of your clay and cut it in half. At this point you will only be using half the clay to make the body of the flamingo. The rest will be used for his neck, wings and tail. NOTE: My flamingo is VERY different from Christi’s. Christi’s has wiggly wings and long feet, but my flamingo is also nesting so you can’t see his legs. To shape your body for a flamingo like mine, make a teardrop and pull out a tail and press it down firmly to the table top. Next add your neck as shown in Christi’s book on page 36. I too did my neck just as Christi showed in her book using a 28 gauge wire so it can keep it’s shape. I did my wings very differently from Christi using two base shapes with a joining curl. For my tail (which Christi’s does not have) I made using simple curls and swirls to make her bum look poofy (Yes, that is a technical term). Christi did her flamingo with awesome long legs made from beads, however my flamingo is nesting … so her legs are curled up under her and she’s just resting on her feet. I was trying to get the pumpkin tut and it brought me here? This is definitely not the tutorial for the fancy bird. Wrong link perhaps. Received today – 17/6/15. Hope you can help with this. OK, I see what you’re saying. And thank you for responding. I just read it, originally, that being like Christi wasn’t a good thing. IMO, we’re learning from her books, so emulating her wasn’t a bad thing. I’ve only been claying for a couple of years. And until Christi I NEVER sculpted anything. Ever. So I don’t know what my “style” is. I haven’t gone to school for art or anything, don’t know “art theory”, lol. So I do it in Christi’s style bc that’s what I know. I’m starting to branch out, tho. I may not be doing all the projects this summer, but that’s bc I’m making stuff for my Etsy shop. I don’t want to be looked down on bc I’m sticking so close to Christi’s style. Just sculpting is out of my comfort zone to me. OK. I gotta ask. What’s wrong with being like Christi? I’ve stuck pretty close to Christi’s style, while doing my own projects. Is that finding my own voice or being to like Christi? Or by being less like Christi, do you mean not making the project exactly like the tutorial? I haven’t seen a lot of that. For instance – JUST for instance – this flamingo looks nothing like Christi’s tutorial. (That’s NOT a bad thing, I’m just using it as an example.) How is this not just making a flamingo? Or is that the direction we are moving in? The project is flamingo, so long as we make a flamingo, that’s good? I can see that…it’s still making us get out of our comfort zones and try things we haven’t tried. I would say all of my projects are strongly influenced by Christi, but with my own ideas. So is that a good thing, bad thing, what we’re talking about or am I way off base? That is a great question. The reason that we don’t want to be like Christi, is that because we all become Christi’s, and we’re not enough like ourselves. Every artist has their own voice. “Voice”, is something that distinguishes your work from everyone else’s work. The focus of the project overall is indeed Christi’s work. However, at some point we need to diverge to become more like ourselves and less like Christi. This being said, you are completely correct that my flamingo looks nothing like Christi’s. It in fact looks very different from Christi’s. The only thing about my flamingo that says “Christi” are the curls in the tail & in the wings. Those curls are very definitely not my style, but are very definitely from her style. I do agree, that my flamingo looks more like me than Christi. It should. It should look like my own and not like Christi’s because I made it, not Christi. Every artist should have a need and want to have their own work be identifiable. Something that tells their fans as well as their purchasers that this is indeed is their original work, though the concept and design may be inspired by someone else. Your designs undoubtably looks similar to Christi’s, but indeed was not made by Christi they were made by you; so therefore they should be more a part of Shannon any part of Christi. Does this make sense? Let me know your thoughts.